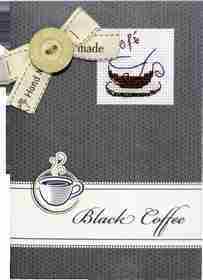 This counted cross stitch card design from Luca-S features a stitched coffee cup on a grey printed card. The kit contains 18 count white aida fabric, stranded cottons, needle, chart, printed card front, matching paper insert, decorative accessories, sticky pads and instructions. Order in the next 24 minutes and it will be despatched today.